I woke up this morning feeling pretty optimistic about my life and my day and started scrolling through my Facebook feed (Guilty as charged but…that’s for another discussion). Today I stumbled upon a VERY INTERESTING article. It caught my attention and I clicked on it. With so many click bait articles online, I usually ignore these posts but then this one….I couldn’t pass. I have a daughter AND a son. And I always tried to motivate both of them to their potential and pay less focus at their looks and beauty or whatever superficial stuff. Girl’s tend to gravitate and care about their look (partly due to all the outside influence) so I will try to put more focus on empowering their own self. I cannot deny her wants to look a certain way BUT I can always remind her that looks do not last forever - it is superficial….It is what inside of you that is important at the very end. To be someone that have skills and brain to get what she wants in life OR to be so obsess with superficial things in life that only last for a while…. She will have to make her decisions. 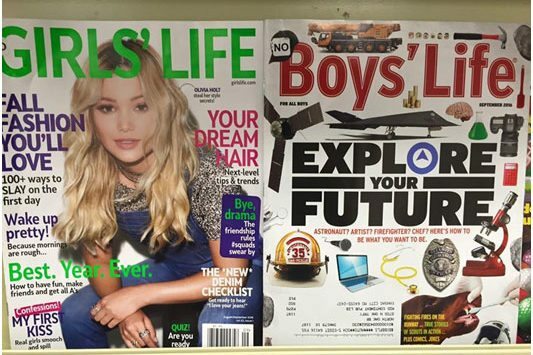 So, to see how this Magazine market their BOy’s Life and Girl’s Life magazine in such drastic differences is a little appalling to me. It is the exact stereotyping that we don’t need. I mean, we girls/women, do like looking and feeling pretty. But it doesn’t need to be over emphasized like this. Especially to a group of young girls (I assume that would be their main target demographic). They are at the age where they should be feeling empowered! They should be able to EXPLORE their future as well! Learn how to deal with life issues instead of boys, hair, drama, fashions…etc. Not that those do not exist in their life but ….seriously, are those SO important that they deserve BOLD TITTLES on the cover? Anyway, I just needed to ramble a little about it. Personal opinion though…don’t kill me for it. Like I said, I love mother and daughter bonding time …. nails, hairs, boys are easy topic to bond BUT don’t forget that LIFE is a bigger and more important topic to bond. Double thumbs up for re-creating this magazine cover! LOVE it! Oct 4 Pick YOURSELF UP. NOW.